You lookin' at me? I'm lookin' at you. jaw with teeth in tact..washed up at Phoenix hotel…probably thanks to hurrican tomas… it has been flown to holland for analysis…would be interesting to hear Dana interview jossy on this…. Thanks for sending the article San, and thanks for posting it, Klaas. "He knows he's a dead man walking". Page 219: In each city I have the privilege to speak to several high schools, churches, or law enforcement and civic groups. This translates to thousands of youths and adults. Delivering this safety mesage is my triumph over devastation. If gives me great joy and is tremendously rewarding work. I think that I can bear the pain of losing Natalee if it means that I can prevent another family from going through our tragic experience. If even just one young person in tens of thousands is saved, then it's well worth it. I noticed one of the articles says something like 'jaw of a man'....how the Hell would Aruba know that? Naturally it would be said to keep attention off Natalee. If it is a man's jaw, then they have plenty of missing men to compare it to. They don't know crap about dead bodies except how to call the media in to get bloody shots for the papers. Bunch of freaks. How much do you want to bet that it comes back as a donkey jaw? Who wants to bet that is the last we will hear about a jawbone washing up in Aruba? I sent the article to Dana. Maybe Dana can call Jossy and see if Jossy knows any more about it. 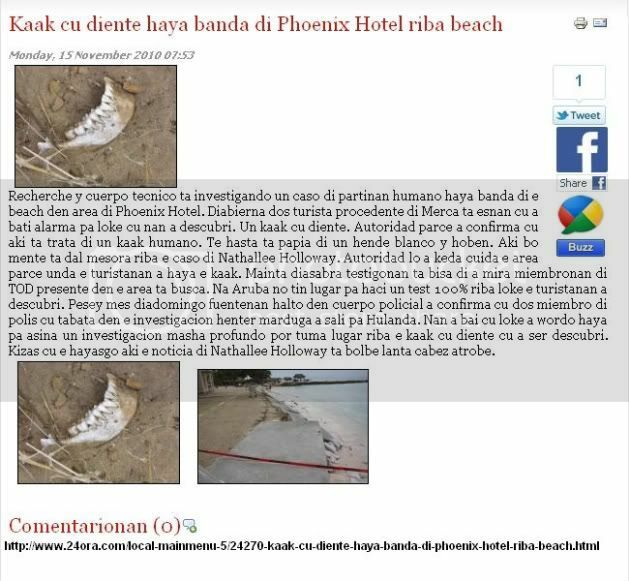 ORANJESTAD(AAN):Un investigacion masha grandi mes a cuminsa diabierna for di momento cu dos turista Mericano a haya un kaak cu diente riba dje riba e beach banda di Phoenix Hotel. Aki ta trata di un kaak parce di hende blanco y hoben segun un investigacion cortico cu lo a tuma lugar. For di fuentenan policial DIARIO tin bon informacion cu dos miembro di cuerpo policial a sali pa Hulanda caminda eynan lo bai haci investigacion profundo. Ainda no kier specula pero ya caba hopi ta pensa cu por ta restonan humano di un persona cu tabata perdi. Hopi ta pensando mesora riba Nathallee Holloway pero esey ainda mester bai wordo proba cu e resultado di labotarium na Hulanda. Diabierna despues cu a descubri e kaak a cuminsa investigacion anochi mes. Parce cu tabata tin vigilancia. DIARIO mes a mira polisnan lora bai direccion di ex strandpolitie diasabra marduga. Esey kiermen cu e area tabata ser cuida. Den dia diasabra testigonan a bisa cu nan mira atrobe autoridad ta investiga den e area. Nan lo tabata mira si tin mas pieza di resto humano cu e turistanan a haya. DIARIO a bai tira un bista tambe despues den e area y a mira cu berdad e lama tabata basta bruto eybanda y a come basta di e beach. Di un of otro forma e lo a coba e santo y saca of benta restonan humano riba e beach. Hopi turista y local ta gusta cana den e area. No ta conoci si polis a bai busca conseho local cerca expertonan. Polisnan mes a tene e caso aki hermeticamente sera pa evita cu e noticia por plama. Ya caba pa dialuna mainta e dos oficialnan cu a bai Hulanda cu e material ta yega y e kaak lo ser investiga den tur profundidad. Aunke ta ser papia cu por ta un kaak di un hoben, por bisa cu eybanda tambe tin indiannan dera. E resultado di e kaak ta importante pa tende kiko esaki lo ta. owing to depart before the netherlands cu material before investigacion oranjestad(aan):un investigacion very big self owing to cuminsa diabierna for by instant cu two tourist mericano owing to attain one kaak cu diente on dje on the beach near by phoenix hotel. here is deal by one kaak seems by person blanco y young according one investigacion cortico cu will did take lugar. 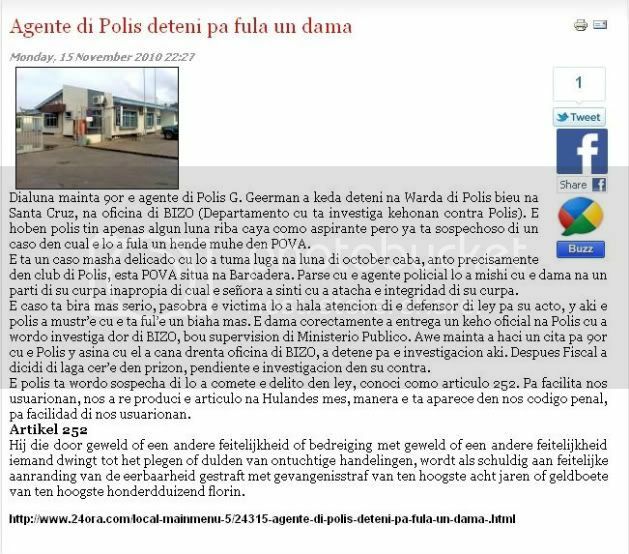 for by fuentenan policial daily paper have good informacion cu two acolyte by cuerpo policial owing to depart before the netherlands caminda eynan will go haci investigacion deep. still does not specula but already come to anend quite is think cu can is restonan human by one person cu was perdi. quite is think at once on nathallee holloway but esey still have to go wordo prove cu the result by labotarium at the netherlands. diabierna after cu owing to descubri the kaak owing to cuminsa investigacion at night self. seems cu was have vigilancia. daily paper self owing to see polisnan lora go direccion by ex strandpolitie saturday marduga. esey kiermen cu the area was being cuida. in day saturday testigonan owing to say cu they see afresh autoridad is investiga in the area. they will was see if have more pieza by remainder human cu the turistanan owing to attain. daily paper owing to go throw one view also after in the area y owing to see cu berdad the lama was enough bruto eybanda y owing to come enough by the beach. by one or another form the will owing to coba the sand y saca or throw restonan human on the beach. quite tourist y local likes march in the area. do not conoci if police owing to go busca conseho local close expertonan. polisnan self owing to hang on to the caso here hermeticamente close before evita cu the news can plama. already come to anend before monday morning the two oficialnan cu owing to go the netherlands cu the material is arrive y the kaak will being investiga in all profundidad. although is being talk cu can is one kaak by one young, can say cu eybanda also have indiannan bury. the result by the kaak is important before hear that this will is. Thanks for the Globe article San! And thanks for posting it Klaas! monday morning 9or the agent by police g. geerman owing to remain deteni at keep by police old at santa cruz, at office by bizo (departamento cu is investiga kehonan contra polis). the young police have barely some moon on caya because aspirante but already is sospechoso by one caso in cual the will owing to feel one muhe in pova. the is one caso very delicado cu will did take luga at moon by october come to anend, then precisamente in club by police, esta pova situa at barcadera. look like cu the agent policial will owing to touch cu the lady at one part by her curpa inapropia by cual the lady owing to feel cu owing to atacha the integridad by her curpa. the caso is become more earnest, because the victima will owing to drag atencion by the defensor by ley before her acto, y here the police owing to mustr’e cu the is ful’e once more. the lady corectamente owing to entrega one complaint oficial at police cu owing to wordo investiga by by bizo, under supervision by ministerio publico. today morning owing to haci one cita before 9or cu the police y so cu past owing to march come into office by bizo, owing to detene for her investigacion here. after fiscal owing to dicidi by allow cer’e in gaol, pendiente the investigacion in her contra. the police is wordo sospecha by will owing to comete the delito in ley, conoci because articulo 252. before facilita we usuarionan, we owing to re produci the articulo at dutch self, manner the is aparece in we codigo penal, before facilidad by we usuarionan. He who by force or other act or threat of violence or other act someone forces us to commit or tolerate indecent acts, shall be guilty of actual indecent assault punishable by imprisonment not exceeding eight years or a fine not exceeding one hundred thousand florin.